NEW DELHI: All the students who are going to appear in rrb 2018, are informed here that admit card for the IBPS RRB Officers Scale 1 2018 preliminary examination has been released on the official website of the IBPS, ibps.in. The candidates who have registered for the IBPS RRB 2018 Officers Scale preliminary examination may download the call letters or admit cards from the official website from today. 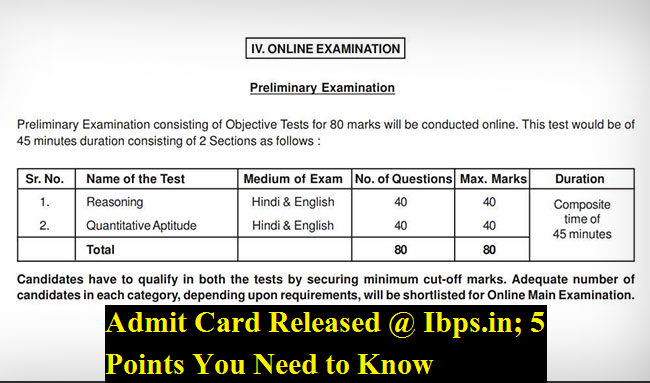 The IBPS RRB admit card download facility will be available shortly. Institute of Banking Personnel Selection (IBPS) kicked off the online registration for the IBPS RRB 2018 on June & July. The candidates should note carefully the Roll Number, Date of Exam, Reporting Time and Venue for the examination given in the admit card. The candidate should be present at the examination hall before the time given in the IBPS RRB call letter. Candidates arriving late will not be permitted to enter the Examination Hall. No query in this connection shall be entertained. Candidates should bring this call letter or admit card alongwith the photo identity proof in original and a photocopy when he or she come to the venue for the examination. Write the Roll No. & Registration No. on the photocopy of photo identity proof. The applicants will not be permitted to appear for the IBPS RRB examination if they do not bring the call letter alongwith the photo identity proof in original and a photocopy. They will be required to put their left thumb impression clearly and sign clearly in the respective spaces provided on their call letter in the presence of the invigilator in the examination hall. A candidate should also bring stationary such as pencils, eraser and a ball point pen to the examination hall. A candidate should do all the necessary rough work on sheet provided only. After the test is over, you should hand over the sheet, given for rough work to the invigilator before leaving the room. IBPS RRB officer scale 1 preliminary examination consisting of Objective Tests for 80 marks will be conducted online. Download RRB VII PT Admit Card, IBPS RRB Officers Scale 1 2018 preliminary examination Officer Scale preliminary exam: 1. IBPS RRB 2018: Particulars to be Noted and punctuality, 2,3, 4, 5..